Once in a blue moon, I read a book that takes my breath away. 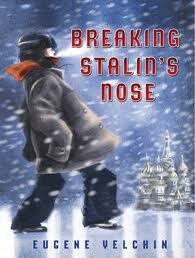 I read (in one sitting) one such children’s historical fiction recently – Breaking Stalin’s Nose by Eugene Yelchin. I first knew Yelchin as a talented illustrator, so was glad to see his drawings illuminate his story here. In this simple chapter book, a depth of insight is revealed, not only about Russia in the early to mid 1900’s, but insight into all fear-driven societies. And we should never be so arrogant as to think it can’t happen to our own, should the perfect blend of circumstances allow it. And to this end, “Stalin’s Nose” keeps us on our toes. Yelchin’s work, drawing from his own childhood in Russia, is not only interesting, it’s important. The book did not win a Newbery Honor for no reason. It’s an excellent read for any child around 10, the age of the protagonist, Sasha Zaichik. But even more, it is a must read for all ages, with each generation understanding a different layer of truth. To pack in so much wisdom about the human psyche into a short 151 pages, for kids no less, is nothing less than brilliant. Upon first glance, the title seems almost funny and too light to include the horrific “Stalin.” Yet it is the perfect balance of an innocent, well-meaning hero facing his realization of a hovering monster, his own society. Usually, when I read a book, I am pretty pleased when I’m thoroughly entertained. But in this case, I was also swept away, left with a feeling of “what just happened here?” Yelchin made me ponder and probe well after my first reading. I think I’d like to read it again and hear your thoughts on it as well.